Dragon Slayer is a Kickstarter offering from Indie Boards and Cards that was recently delivered to backers. It combines a simple push-your-luck decision making with the fun of rolling high-quality custom dice to deliver a simple yet enjoyable experience. It does not translate well to larger groups though, as the attempt to introduce player interaction falls short. 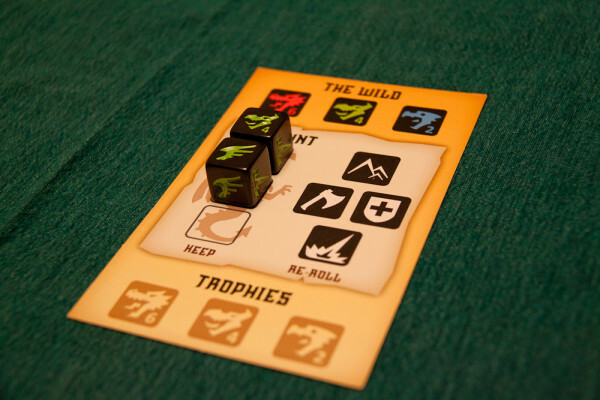 In this short dice game by David Mortimer, 2-6 players go dragon hunting as famed Slayers, each attempting to outdo the others in massacre of creatures most agree to be sentient. You hunt by rolling three warrior dice with three dice representing the dragon. You are attempting to roll (“find”) the three parts of the dragon – head, wings and tail. 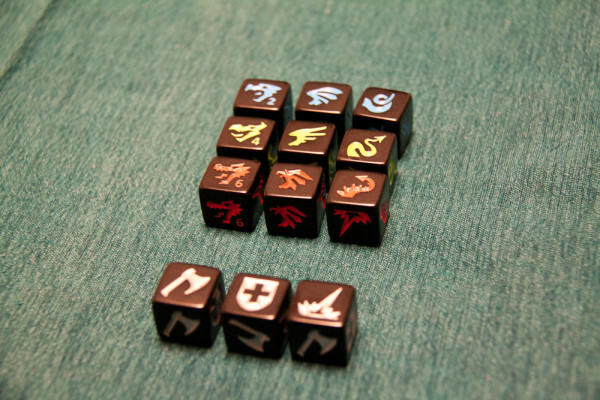 In return, you can be burned if either one of dragon dice or warrior dice comes up with the flame symbol. The warrior dice do feature shields to block some of the flames as well. Once you have successfully rolled the entire dragon and have at least one warrior die showing an axe – you can score that dragon and decide if you want to keep going. There are three dragons in the game – blue, green and red (neatly following the classic D&D progression of dragon power), each worth more points but more likely to burn the slayer. The decision whether to keep hunting or to stop and which dragon to hunt are the only real decisions the game lets you make. The rolling goes on until either you find and slay the dragon or you lose all your warrior dice and are dead (if it comes to this naturally you lose all the previously accumulated dragon points). Green dragon flight path and hunting area discovered – now to find the lair! One interesting mechanic that sets Dragon Slayer apart from other similar games like Zombie Dice or Dungeon Roll is ability of players to Challenge another once per game. It is a formalized dare to keep going after a player decided to stop (presumably, because he was running low on dice). If the challenge is declined, the timid slayer only scores half the points for all the dragons he took care of this turn. If the challenge is accepted all further dragons are worth double points. A failure to either take on the challenge or to slay at least one dragon nets the challenger extra points. 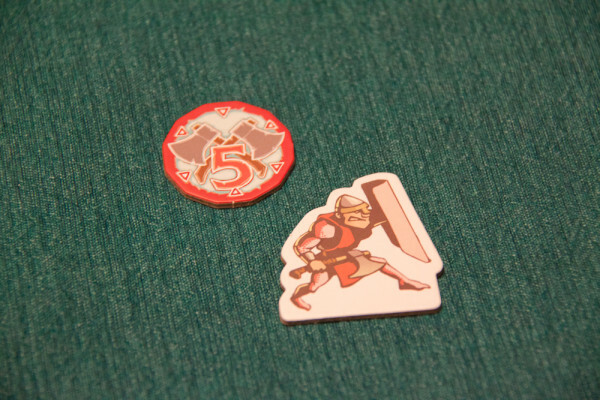 The red slayer token and challenge token – you only get one so use it wisely! The game goes until someone scores 40 points, tracked via coloured cubes on a small scorecard. In smaller groups this can be easily done within 15 minutes or so, but the game overstays its welcome with 5 or 6 players. The scarcity of meaningful decisions makes this more of a filler material – rolling the (very well made) dice is fun, but luck has a huge impact on the outcomes. While the order in which you tackle the dragons might make a difference, a series of lucky rolls can net you huge number of points within a single round. Game goes to 40 points – white and green better hope black gets some lousy rolls! The challenge system was what drew me to this game initially and made it stand out, however it does not seem to have that much impact – there is either not enough reason to use it or it is too little too late to stop a runaway leader. The fact that it is a once per game effect also makes its use awkward by producing confusion if any given circumstances justify it. Without the Challenge system, the down time can get quite long and I found the game works best with two or three players – it is fluent and dynamic. Larger groups might start getting distracted and that is never good in a filler game. 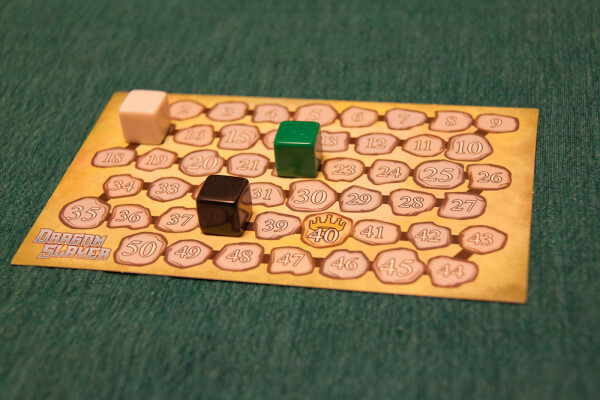 Despite these drawbacks, Dragon Slayer achieves its’ modest aim – it is a fun, quick, easy to learn game with quality components and more strategy and interaction than its competitors. It is also worth pointing out that Indie Boards and Cards did a fantastic job on running this Kickstarter, delivering the product exactly as promised. Completely satisfied my expectations as a backer.